Subtropical coastal cities are among the world’s fastest growing urban areas, but they are also highly vulnerable to the impacts of climate change, such as: increased flooding; higher rates of vector-borne diseases; more frequent and intense heatwaves and storms; and rising sea-levels. Low-lying coastal cities such as Gold Coast (Australia) and Fort Lauderdale (USA) are a case in point and the Intergovernmental Panel on Climate Change (IPCC) has recognised them as particularly vulnerable. 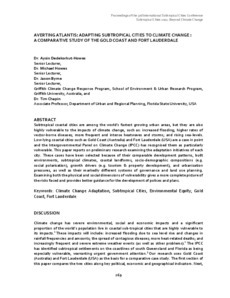 This paper reports on preliminary research examining the adaptation initiatives of each city. These cases have been selected because of their comparable development patterns, built environments, subtropical climates, coastal landforms, socio-demographic compositions (e.g. social polarisation), growth drivers (e.g. tourism & property development), and urbanisation pressures, as well as their markedly different systems of governance and land use planning. Examining both the physical and social dimensions of vulnerability gives a more complete picture of the risks faced and provides better guidance for the development of polices and plans.